Inventory We are a resale marketplace, not a box office or venue. Ticket prices may exceed face value. This site is not owned by Adrienne Arscht Center . The Adrienne Arscht Center for the Performing Arts opened October 5, 2006 as the second largest performing arts center in the United States. 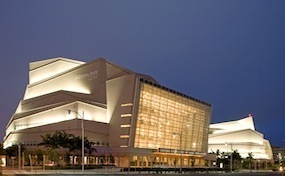 The Adrienne Arscht Center box office is located on 1300 Biscayne Blvd in downtown Miami, FL. The Ziff Ballet Opera House is the largest of the three theaters inside the Arscht Center and has a seating capacity of 2,400. The performing arts center has become the premier place in the Miami metro area to see the hottest traveling Broadway performances. Adrienne Arscht Center tickets have included hit musicals like Wicked, Jersey Boys, Beauty and the Beast, The Lion King, and now the Book of Mormon. The Ziff Ballett House is shaping up to have another banner year in 2017 with the likes of Jersey Boys, The King And I, and Beautiful the Carole King Musical. The Ziff may be one of the only venues in the country that offers a free Gospel concert every Sunday. The Adrienne Arscht Center as a whole offers 400 plus performances a year. Speculation has been that the center brings 450,000 people to downtown every year. Miami-Dade County public schools also benefit from the venue which offers a 6 week summer camp which started in 2009 and has continued to be a wonderful oppurtunity. CenterMiami.com is not currently affiliated with any official website, box office, or primary supplier. We are an independently owned and operated company that concentrates solely in the online resale of all events in the secondary tickets market. Prices on our sites may be well below or above face value and can change quickly with market conditions. To order ticket for all Adrienne Arscht Center Ziff Ballet Opera House events simply follow the steps online through checkout or call our operators at anytime.